Forever! 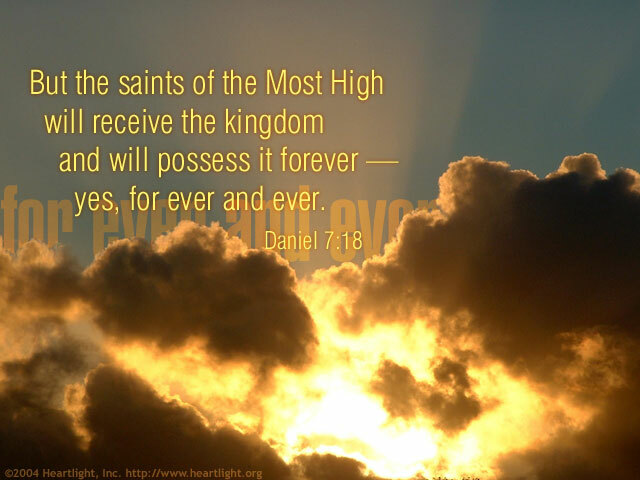 The Kingdom will belong to God's saints, his children, the people of the Most High (see Daniel 7:27), us! And it will be ours, forever... and ever... and ever. Praise God for his promises, his grace, and his faithfulness. Almighty God Most High, I look forward to the day that your Kingdom rules in power and your will is done on this earth as it is in heaven. I thank you for your promises to us, your people, and I thank you for giving your children a Kingdom that cannot be shaken. Bless me, O God, as I seek to live my life each day in reverence and awe at your awesome holiness and grace. In Jesus' name I pray. Amen.